Gerhardt Soul Foundry... wow, this is a bit insane! Remove my (insert amazing creature here) from the game, then continue to make more each turn. Wow. This card has the potential to a force to be reckoned with in constructed, and in limited too. There will be a good deal of artifact removal in Mirrodin, I'm sure, but if you can get this thing to stick...yikes!! And we end the week with two cards that feature another keyworded mechanic from Mirrodin - Imprint. All the cards with Imprint feature a similar mechanic - taking a card from somewhere and "imprinting" the card on the card with Imprint. The card can come from most anywhere - either player's hand, in play, or other places. The card with Imprint then takes some aspect of the imprinted card and does something with it. 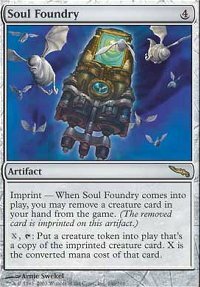 With today's card, you Imprint a creature card from your hand onto Soul Foundry. You then can pay its converted mana cost (not its actual mana cost, mind you - you don't need to worry about color) to make a token copy of the creature every turn. Exalted Angels? Yup. Blistering Firecats? It's getting Hot in Here. (Sorry, I know, bad joke.) Nantuko Shade? Sure, in Extended. Goblin Sharpshooter? Talk about a firing squad. After the initial burst, though, I fear this card will turn out to be worse than everyone is thinking at this point. It's still a decent card, yes. But with all the artifact hate that is going to be in decks come October 20, this will more often cost you a card than it gives you any benefit. 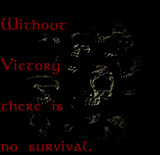 In limited, the risks are less, but still there. If I had a hot creature (even a good, off color creature just for this), I think I'd play this. more so... lots of potential. evil. I can't wait to abuse it. I like the art on this card. This card is pretty good, but the X cost to activate it may be too much to make it worthwhile. In limited a creature making machine is great, but one thats specifically good is amazing. Expensive maybe, but still a solid card- especially with creatures that have come into play effects. a way to make any one of your favs come back or multiply. for opponents to put artifact removal in.